Today my team lost… er… got smashed. 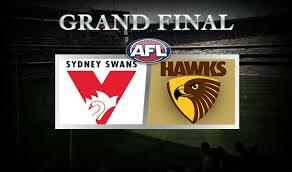 My beloved footy team, the Sydney Swans, today lost the Grand Finals – the Super Bowl of Aussie Rules football. They not only lost – they got smashed. It was so bad that in the last quarter I started doing emails. Then I had a shower. Then I took the dog for a walk around the block, even though I don’t have a dog. Nor do I have a block. I love my team. Whether they win or lose. That’s probably the definition of a fan. For richer or poorer, in sickness and in health. Till death do us part. My good friends Peter Landers and Julie (the famed Landers Express) are ardent Hawthorn supporters. The Hawks. They’re the team that won. They’re the team that embarrassed us. They’re the team that showed us how to play Grand Final footy. Peter and Julie wear orange and brown underwear, I swear. They’re the Hawk’s colours. This morning they probably ate bird food for breakfast. They love their Hawks just like I love my Swans. And I’m delighted for them that their team won. Because they played better footy, and were by far the best team out on the park today. Was I disappointed? Was I shattered? No, not really. I was disappointed it wasn’t more of a contest. I’d have enjoyed a closer match. But it wasn’t to be. This generation of Hawthorn players, with their coach, are heading into legendary territory. Today was a back-to-back flag win. That happens rarely. Fact is, my team gave me so much pleasure this season. The characters, the ups and downs, the grace and doggedness under pressure at times. I watch sport because of the Shakespearean nature of it. It’s all about the people, the personalities, the ambitions, the failings, the strength of will, the grit. As with anything, the more you invest in a team, the more you get out of it. I’ve got a lot out of the Swannies over the years. At this point in my life, I’m trying to divest myself of outcomes. The enjoyment comes from watching the game, not from winning or losing. It’s not taking the fun and enjoyment out of the game – on the contrary, when your team loses, why should you be upset? You should be happy for the fans of the other team. Similarly when your team wins, it’s ungracious to gush and carry on. Where does that get you? Success and failure come and go in sport, as in life. Often times failure is fundamental to future success. The biggest lessons are forged out of failure, or rejection. I was watching the #goswans Twitter feeds today, and some of the comments from the Hawk supporters, and the Swans supporters too, were pretty foul. Where does that get you? It might make you feel good momentarily, but that kind of unsympathetic energy only comes back at you at some later stage. Some people – some fans – get very angry. They get angry at their team for losing – for letting them down. And they get angry at the other team for winning. And sometimes they get angry at the referee for what they believe are bad decisions, which might have contributed to their team’s loss. The pinnacle of this is the rioting and violence we sometimes see in Europe at football games – where the fans are often penned in like animals with wire grills around them and rows of police with tear gas weapons, to stop them attacking the fans from the other side. Often these violent fans are mired in social problems at home or in the workplace. Many are unemployed, depressed, they have low self-esteem etc. And they identify so strongly with their team that when they lose, it’s a personal slight. A denigration of how they see themselves. And the anger that’s been festering at home or at work explodes viciously at the stadium. Fact is there’s no such thing as winning or losing. Not on an esoteric level. In politics I used to get so het up about particular parties and politicians – and now I realise they’re all pretty much the same. The shading is a bit different, that’s all. What did The Who say? Meet the new boss… same as the old boss. Ah, Bill, you had me fooled there for quite a while and then you come out in your true colours at the very end!! 🙂 I got stuck at the main Copenhagen train station just last week because of the numbers of supporters of the soccer teams playing that day … it was frightening to see that they had to be controlled by lines of police, even here in ‘peaceful’ Denmark. The noise level was unbelivable and I can’t imagine what it’d be like at the station itself! Apparently, the police went as far as to remove a couple of young teen boys from an area as they were barracking for the opposing team to the supporters around them and the coppers were worried about them getting hurt! It’s a twisted world we live in at times!! Bill, thought you were going soft on us…. until I read your last sentence.. hahaha. Hey Ingrid – I’d never go soft, unfortunately. Maybe I should. Maybe I’m a deeply confused individual. I am highly competitive at heart. But I’m trying to see that in a broader context. It might take this lifetime and a couple of others!